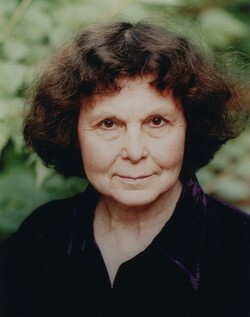 Sofia Gubaidulina was born in Chistopol in the Tatar Republic of the Soviet Union in 1931. After instruction in piano and composition at the Kazan Conservatory, she studied composition with Nikolai Peiko at the Moscow Conservatory, pursuing graduate studies there under Vissarion Shebalin. Until 1992, she lived in Moscow. Since then, she has made her primary residence in Germany, outside Hamburg. Gubaidulina made her first visit to North America in 1987 as a guest of Louisville's "Sound Celebration." She has returned many times since as a featured composer of festivals — Boston's "Making Music Together" (1988), Vancouver's "New Music" (1991), Tanglewood (1997) — and for other performance milestones. From the retrospective concert by Continuum (New York, 1989) to the world premieres of commissioned works — Pro et Contra by the Louisville Orchestra (1989), String Quartet No. 4 by the Kronos Quartet (New York, 1994), Dancer on a Tightrope by Robert Mann and Ursula Oppens (Washington, DC, 1994), the Viola Concerto by Yuri Bashmet with the Chicago Symphony conducted by Kent Nagano (1997), Two Paths ("A Dedication to Mary and Martha") for two solo violas and orchestra, by the New York Philharmonic conducted by Kurt Masur (1999), and Light of the End by the Boston Symphony Orchestra under Masur (2003) — the accolades of American critics have been ecstatic.